What’s new and exciting at The New Children’s Museum? One of Downtown San Diego’s most exceptional attractions, The New Children’s Museum, provides an educational and playfully enjoyable experience for children of all ages. Located in the Marina District on Island Avenue and Front Street, the museum is ever evolving and improving its exhibits. This year, it has commissioned several artists to create art installations to impress and awe museum visitors, both big and small, old and young. Those featured artists include an established young San Diego-Tijuana mural artist and an internationally renowned artist from Canada. These two talented individuals will each contribute separate and distinct art mediums that will stimulate and excite the young museum visitors. The first art experience occurs as you walk across the museum’s impressive entry bridge through an eye-popping, 48-foot mural entitled “Smile.” It is an avant-garde mural designed of various lines of colors, an assortment of numerous shaped eyes (eyeballs), sailboat “smiles”, and abstract heart-shaped noses that seem to float across the bridge in a random pattern welcoming the young visitors to a fun exploration of art. 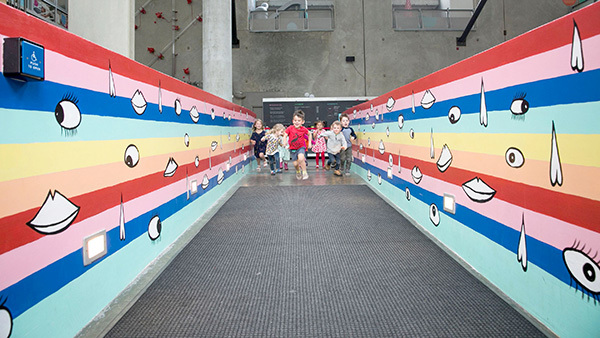 The mural exposes children to abstract art by using a simple theme of eyes, noses and smiles to stimulate their senses. “Smile” is the wonderful creation of a Chula Vista-born artist named Paola “Panca” Villasenor, who is noted for her many Tijuana-San Diego murals. She recently completed a 45-foot-high mural, similar to the simple design of “Smile,” entitled “La Calors” (the heat). The “La Calors” mural is located in Barrio Logan on the wall of a flour silo. Both works represent simple and fun designs that will bring smiles to the faces of viewers. A greatly anticipated and exciting art addition, “Whammock” by internationally renowned fiber artist Toshiko MacAdam, will debut at the museum on June 15. MacAdam creates climbable, large-scale textile art structures as playgrounds for children. Imagine an art structure as a very large trampoline covering an entire room, created from a very resilient and flexible fibre that stretches, allowing children to play safely while climbing across its beautiful design. “My work is about the joy of bringing children together to play and having their movements and vibrations activate the art,” said MacAdam. 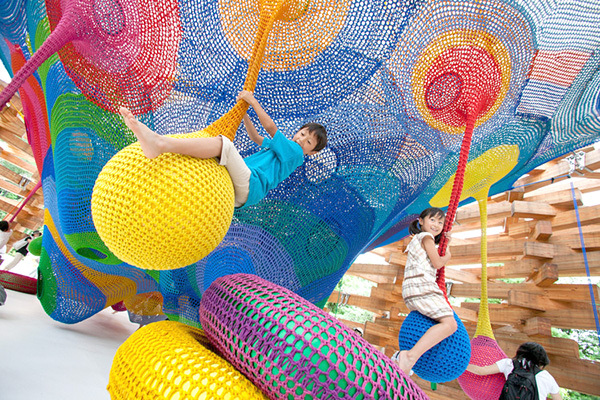 Toshiko has created many playground structures with beautiful, uniquely created knitting designs. The uniqueness of play sculptures allow children to not only view the beautiful design of the net, but to touch, play and experience the wonders of texture. As Tomoko Kuta, deputy museum director at The New Children’s Museum stated, “From the first time my son played in MacAdam’s ‘Woods of Net’ Pavilion at the Hokone Open Air Museum in Japan, I dreamed of collaborating with her. We are thrilled to be working with Toshiko, someone who creates beautiful, immersive sculptures and who understands the needs of children.” The New Children’s Museum is excited to add Artist Toshiko’s macramé art pattern to its offerings. These two outstanding artists will provide the museum’s attendees with a fun way to experience different artistic techniques that will cultivate a lifetime interest in the appreciation of the world of art. Because The New Children’s Museum is constantly commissioning new innovative exhibits such as “Smile” and “Whammock,” it has become one of the most outstanding children’s museums in the nation. In fact, The New Children’s Museum has been chosen as one of 30 finalists vying for the prestigious 2019 National Medal for Museum and Library Service Award, presented in June by the Institute of Museum and Library Sciences (IMLS) in Washington D.C. Only five museums in the entire nation will receive this prestigious award and it is hoped that our museum will be so honored. San Diego and the Marina community have much to be proud of in our local children’s museum. Come and visit The New, “always dynamic,” Children’s Museum to view, interact, and explore. — Joan Wojcik is president of the East Village Residents Group. Contact Joan at eastvillageresidentsgroup@yahoo.com or visit evrgsd.org.